New Hampshire-based company, Rugged Aluminum Trailers, offers industry-leading enclosed trailers that are perfect for many professions. HUDSON, NH, UNITED STATES, March 5, 2019 /EINPresswire.com/ -- New Hampshire-based company, Rugged Aluminum Trailers, offers enclosed tow-behind trailers that lead the industry in all standards. Not only are the trailers durable and long-lasting, but they are also convenient, safe, and lightweight – which is significantly better for the vehicles towing them. In addition, the enclosed trailers come in a variety of industry standard sizes to ensure there is a perfect fit for all desired uses. This includes everything from trailers needing for occasional use, to business owners needing a trailer for daily, or long term work. Since these enclosed trailers are made of aluminum, they are significantly lighter than those made of heavier metals. This matters because the vehicle you will be using to tow the trailer needs a lower tow capacity – meaning you can use a smaller vehicle, such as a standard sized car, versus needing a heavy-duty pick-up truck. You will also use less gas when towing the trailer (equaling money saved), and your vehicle will receive less general wear and tear. Aluminum is a type of metal that undergoes a process called oxidization when it comes into contact with atmospheric air and moisture. What this means is that the metal naturally creates a barrier to protect itself, and therefore does not rust. Since aluminum does not rust, it obviously does not have the issues that come along with rusting. This includes both the unsightly look of rust and the way it can compromise the integrity of metals like steel. With a great number of different standard sizes available (plus custom sizes available), there is almost no end to the uses that these trailers can be used for. Everyone from the average person who needs an occasional use trailer from the business owner who needs daily, long term use. 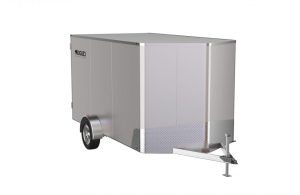 There are many possible uses for Rugged Aluminum Trailers’ top-of-the-line, industry-leading enclosed trailers. They are perfect for a wide array of businesses. For example plumbers, landscapers, woodworkers, general handymen, cleaning services, etc. They are also great for people who have large properties where certain items need to be carried back and forth. A great example includes farms and ranches. Of course, the average person who may occasionally need to move large items can also benefit from these aluminum enclosed trailers. Based out of the New England state of New Hampshire, Rugged Aluminum Trailers has been in business for over 47 years. During this time, they have built a strong, nationwide reputation for having quality craftsmanship and innovative product designs which stand up to the harsh northeast winters. For more information, you can visit their website at www.ruggedat.com. Alternatively, you can email them at info@ruggedat.com, or call them at (603)324-7402.